It seems like a concept taken from sketch comedy, but for the last year, America has had to give actual, serious consideration to Donald Trump’s plan to build a massive wall along the U.S.-Mexico border as a means of quelling illegal immigration. Many feel that this strategy is ridiculously impractical, not to mention expensive, but the idea has nevertheless struck a chord with many voters. 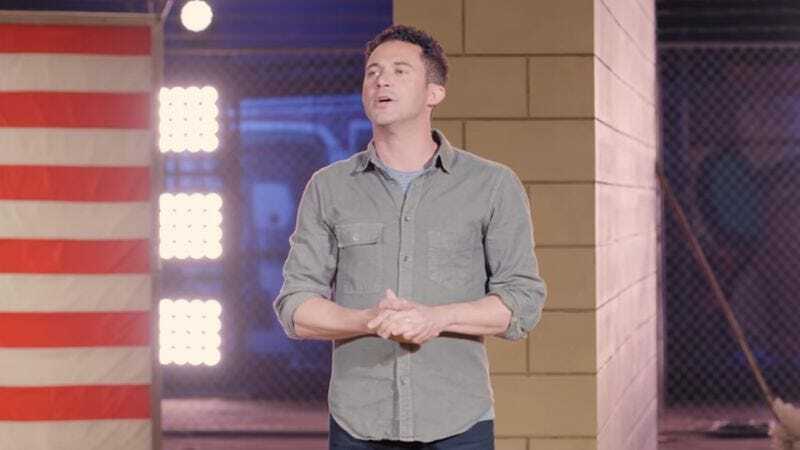 Comedian and magician Justin Willman, best known to TV viewers for his appearances on The Food Network’s Cupcake Wars and Disney’s Win, Lose, Or Draw, hasn’t been swayed by the hype, however. In an excerpt from his act posted to YouTube, Willman presents a trick he calls “The Unity Wall.” Measuring 20 feet by 15 feet and made of “solid American concrete and steel” with barbed wire on top, Willman’s wall is surrounded by guards on all sides. It seems that an imposing structure like this should keep the magician from successfully crossing the stage. But, no, he appears to pass right through it as though it weren’t even there.